A good pirate always looks the part. Whether you're on leave on a tropical island or sailing to new lands, it's important that you always look like you fit the part. After all, you wouldn't want anyone accusing you of being a traitor, would you? And if you have to look the part, then why not do it in style. They say that blondes have more fun. And on a pirate ship ... well ... there'll be tons of gold and rum. (All that equals fun to us). 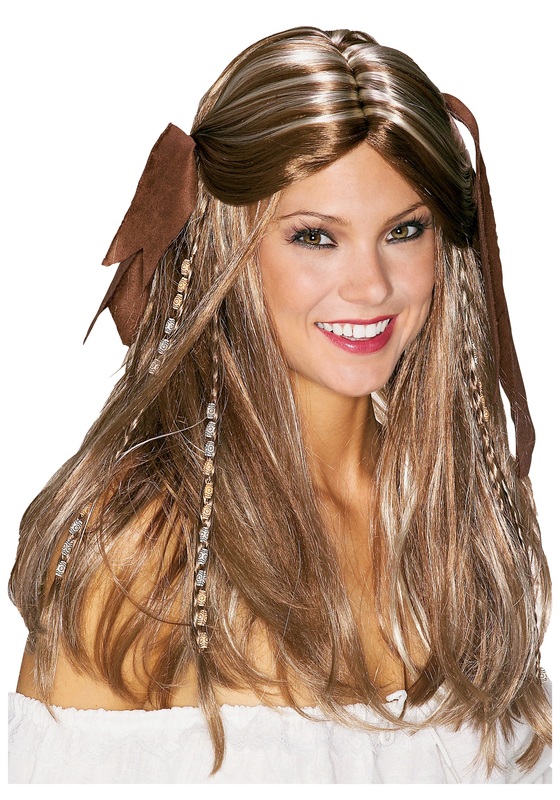 You're sure to have a blast in this Caribbean Pirate Wench Wig. No matter how many scallywags you run into, this wig will keep you looking good all night long. This blonde pirate wench wig comes ready for the high seas. The dark blonde hair is made of synthetic hair with light blonde highlights throughout. The hair is attached to a mesh lining so that it's comfortable to wear for long periods of time. No scratching your head constantly while wearing this wig! Beaded strands and ribbons are intertwined throughout the wig for added detail that's worthy of the sea.